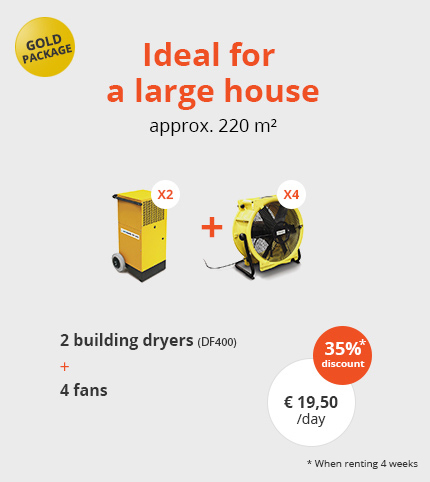 Why hire a building dryer? Visit our shop for the latest prices. 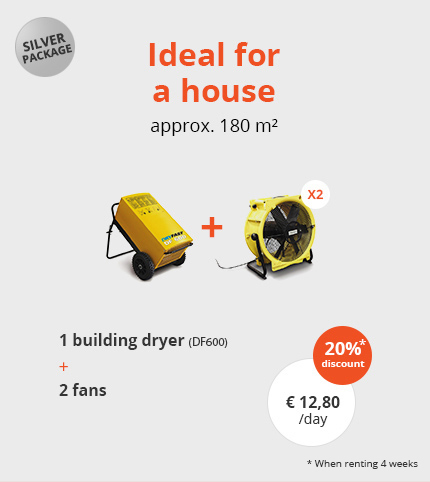 Do you want to avoid any delays in your building project? At buildingdryers.be you are at the right address! In practice, the planning of a new build or renovation project often does not run as expected: the schedules of the different contractors are not properly coordinated, so that the completion deadline risks being compromised. In such cases, the use of building dryers is necessary. What if I do not hire a building dryer? If you do not hire a building dryer, you will have to wait a long time until the building moisture is evaporated. If you continue with your project when the screed for example has not yet dried, you may cause damage to your own home. In the best of cases, such damage will be limited to peeling paint. However, if you have installed your parquet floor while the screed was still wet, the floor may swell. When the kitchen is installed against a damp wall, even mould growth may occur! 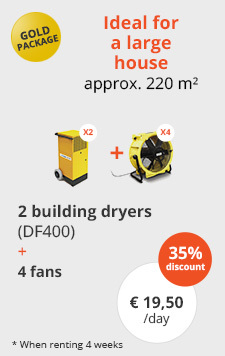 Hiring a building dryer is interesting for those who want to finish their home. Many contractors will refuse to start their work if the subsurface has not yet fully dried. A good example are epoxy floors: the screed must be bone-dry before the floor can be installed. Also that dressing you have been dreaming of cannot be installed before the plasterwork is completely dry. Do you want to avoid having to cancel an appointment made with the next contractor? 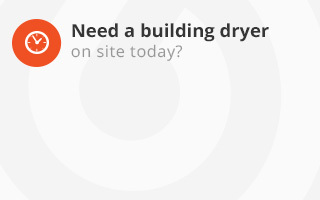 Buildingdryers.be helps you avoid delays or building horrors. A building dryer is a powerful dehumidifier that causes the building moisture to evaporate faster. The subsurface will dry up to 70% faster, thereby significantly advancing the building process. Also when you are already experiencing these troubles, buildingdryers.be will help you cure them. In the case of rising moisture, make sure to have the problem area injected, we will then solve the moisture problem with building dryers, fans and, if necessary, additional heating. After this process your wall or floor will look as new again! 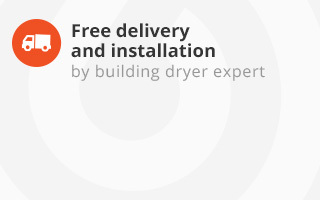 Buildingdryers.be will be happy to assist you with your building project. 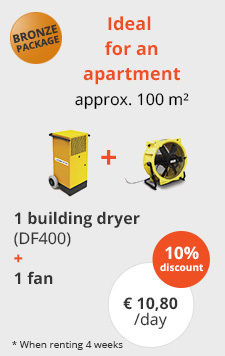 You can call on us for hiring building dryers, fans and electric heaters. Do you have questions or would you like to receive a quote? Do not hesitate to contact us at 0476/20.41.56 or use the contact form. Would you like to receive a detailed quote and are you in possession of a digital plan of your home? 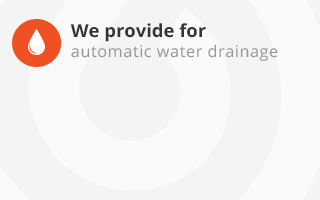 Then email it to Ruben@bouwdroger.com so we can send you a no commitment quote. The best proposal tailored to your project? Get a proposal today using our configurator! 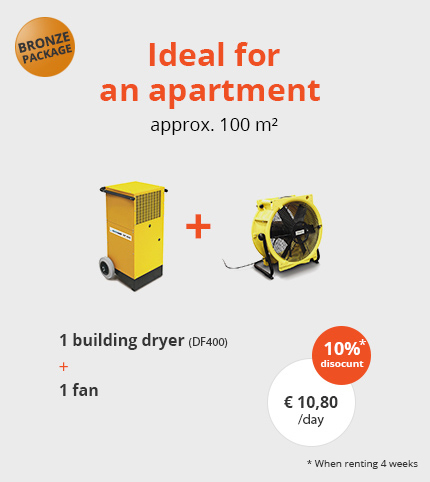 Thank you for your punctuality in the delivery of the construction dryer, and for Jelle’s friendly explanation. I’m very happy about the deliveries, as well as about the appliances. Whenever possible, I will certainly recommend your firm to my friends and acquaintances. 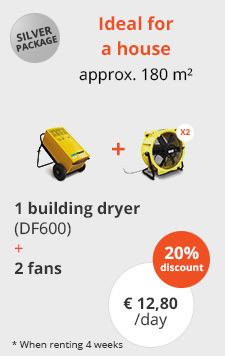 We are 200% happy about the construction dryer DF800 that we used in our building. Poured the screed in early May and 6 weeks later we had our cork (yes, yes, cork!) placed!! If possible, could you pick up the two DF 200’s on Monday 27 August (preferably in the morning)? We’ve had them for one month now. The result is without a doubt exceptional! 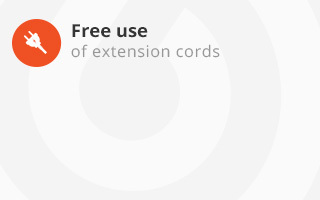 We should have done this much sooner…!